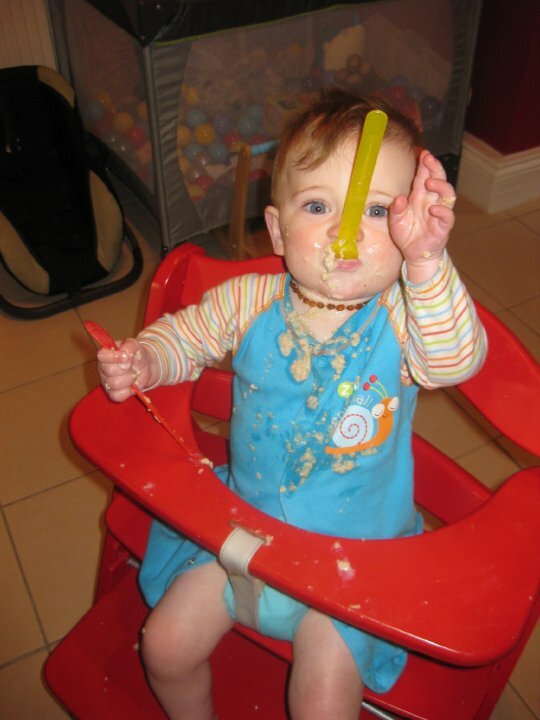 We love baby-led weaning!! 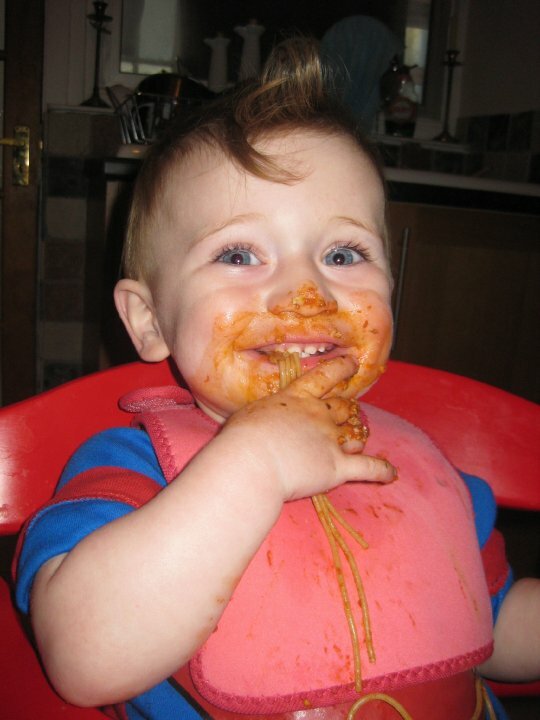 Baby led weaning means allowing your baby to lead the way – they tell you when they are ready to start solids (around six months, when they can sit unassisted and start grabbing food of your plate), and they eat the same food as you, as it is – so there’s no pureeing. The Baby-led weaning book is my favourite parenting book and I highly recommend it to every parent. It’s makes for more adventurous eaters – it’s great showing off your kids eating things like olives and prawns and mustard! It’s less cooking and washing up for you – as everyone eats the same food at the same time. Offer a selection of foods and allow them to play with it and eat what they want. Even if they seem to not like something, keep offering it a few times to give them opportunities to try it again. Don’t worry if it all ends up on the floor! 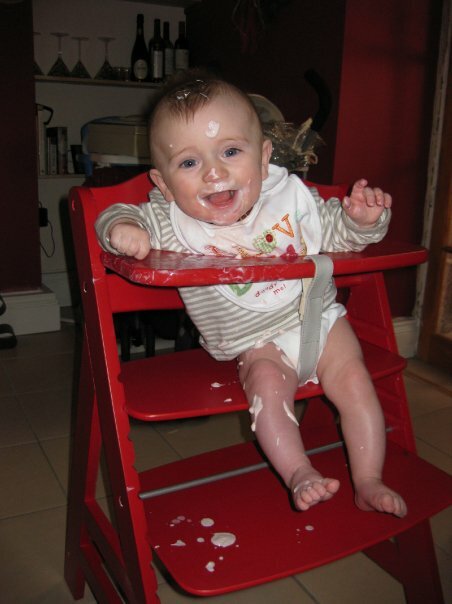 If you are worried about giving your baby solid foods straight away, then try to team up with a friend who has done baby-led weaning (ideally one who is a couple of weeks ahead of you) so that they can give you more confidence. Sharing mealtimes is also a great way to give you a break from cleaning up once in a while!! Enjoy it and take lots of photos! Here are three of my favourites of Oscar. My very own (Flexi)Mum went to university when I was 8 and trained as a teacher. At the time she was a Mealtime Assistant at my primary school – she is now the Assistant Headteacher of the same school (which incidently is the school I’m hoping my little man will be starting this September). Some years ago, at the grand old age of 33, I decided it was time I got a proper job! I had worked in pubs and shops and offices but felt unfulfilled; I could be heard to say that I didn’t want to have “Here Lies Unfulfilled Potential” written on my tombstone. I was really the only person that could ensure that that didn’t happen. I was the single Mum of two lovely children, both of whom were now at school. This was my time! I embarked on a Return to Learn course, which led onto an Access course and then a teaching degree at Exeter University – in total a five year project! Five years in which I sometimes felt out of my depth, and wondered who I was kidding to think I was capable of a degree; however, it was also five years in which I felt enlivened, excited and energised – I realised I did have a brain and that I loved delving into literature and its hidden meanings, and I also learned that I could “feel the fear but do it anyway” to paraphrase a well known saying! I am now in my 13th year of teaching – having gone from Mealtime Assistant to Assistant Head Teacher – and I can honestly say I never feel unfulfilled! I believe that there are often unintended consequences of our actions – I think my children saw a good role model – and so did some of my friends – 3 of them have gone onto study at university – one to PHd level, after watching me and seeing anything is possible if you put your mind to it! If you are remotely tempted to make a change, take a leap of faith, give it a go – what have you got to lose? …..Oh, and Good Luck!